This is my attempt at a design of the Lenwoloppali Differential Equation Scanner, as seen on an early episode of The Big Bang Theory. On the show, Leonard drew a rudimentary UI solution, but this is my take on it, after thinking through the characters' motivations (though perhaps not their aesthetic considerations). 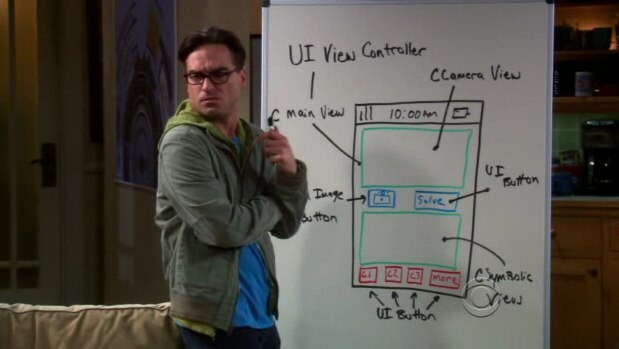 On the show: Leonard's drawing of how he envisioned the UI. I used this as a starting point to build my own. Unfortunately, I don't have any of my own drawings this time, but I did notice how much screen space was afforded to the camera, and I wanted to do the same. I wasn't sure what he meant by 'symbolic view,' but think I was fairly true to the original. Opening screen: The logo is a simple icon of an abacus, and Proxima Nova was chosen for its clarity.